Today, the National Law Enforcement Officers Memorial Fund (NLEOMF) (probably not an unbiased source) decried a “spike” in “firearms-related” fatalities of law enforcement officers in the United States in 2014. There were 50 “firearm-related” deaths in 2014, compared to 32 in 2013. NLEOMF Chairman and CEO Craig W. Floyd said, in NLEOMF’s news release, “Enough is enough. We need to tone down the rhetoric and rally in support of law enforcement and against lawlessness.” The “spike” in “firearms-related” deaths was part of an “increase” in deaths of law enforcement officers from any cause. To be clear, I generally support law enforcement officers, although I do not support their illegal actions any more than I support the illegal actions of any person. And, to be honest, given the trust that society places in law enforcement officers, I think that illegal acts by law enforcement officers, especially involving violence against citizens, should be punished much more severely than illegal acts by non-officers. But I still think that law enforcement officers dying is a very bad thing. (Source for table) But, as you can see, the attacks declined again the following year and every year since then. 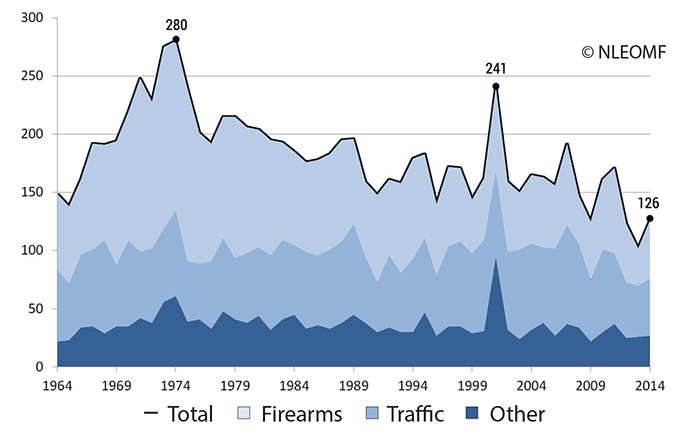 In fact, the NLEOMF’s own information shows that 50 firearm-related deaths per year is low. Since 2004, there were the fewest firearm-related deaths in 2013. The 2014 number, 50, is the next lowest number of firearm-related deaths among law enforcement officers in the last eleven years. Fifty deaths is still below the eleven-year average of 54.45. I think it’s a little premature to claim that there is some sort of new problem. Excuse me a sec while I get out my soap box and climb on it: I tried to see if I could compare these statistics to the numbers of people killed by law enforcement officers. That is, however, impossible. Although the FBI keeps detailed statistics on the number of police officers killed each year, and about crime generally, it does not keep statistics on the number of people killed by law enforcement each year. As a Gawker blogger said, the absence of such a database is likely intentional. Given that police agencies across the country regularly report detailed data to the FBI, it would not be that difficult to add a few lines to the submission by each agency to detail killings by police officers and for the FBI to compile those statistics. OK, I’m off the soap box now. But really, let’s not use fallacious interpretations of two data points to argue that there is a national crisis developing. Let’s look at some real data, perhaps by examining each killing and any discernible reasons for them.